The image on this card is a very powerful and disturbing one, it pulls no punches. The Tower Card message for today seems to me, to be very relevant, both for individuals and also for the collective. The base of something; whether it be a relationship, an economy, an endeavour, or the motivation of a group of people, has of necessity to be built on solid and firm foundations. 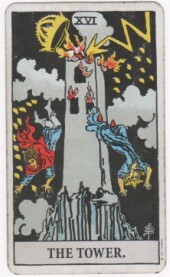 The Tower Card symbolizes the catastrophes, strokes of fortune, and unexpected events that appear seemingly out of the blue, to test these foundations to the limits. What foundations is our society built upon? Are they going to stand this testing time? What foundations are our lives built upon? In my own life, I can feel that the foundations my own ‘tower’ rests upon, are very rocky and the masonry is starting to fall about my ears. Is there anything shaky in your life that needs your immediate attention to prevent a collapse? How do we personally and collectively build a life and a society on firm foundations? The Tower card message for today cannot be ignored, it will not go away. Does the edifice have to crumble completely, before something stronger and more durable is built up to replace it? Or can we, by heeding the very obvious warning signs, act swiftly and expediently, to rebuild our respective towers before their total collapse? Please leave a comment below, because I would love to know your views and opinions.